This is the voice of Metaverse One, greetings to my blog covering the 3D web, virtual worlds, mirror worlds, virtual & augmented reality, people, companies, standards, news, and technologies of the mixed reality Metaverse. These views are my own and do not reflect those of any collaborators. Hope it helps in your migration! -event website This year was the best year for AWE in my opinion and their biggest ever. The event brought in 4,700 attendees, 351 speakers, and 212 exhibitors from all over the world. Christian Perry has been a community organizer and collector of knowledge on the West Coast for some time. His SF Beta events are one of many that have helped educate the masses to high tech and take entrepreneurs from idea to funded startups. Christian's latest endeavor is the podcast Whale Con: The VR Pioneers. I had the opportunity to chat with Christian a couple weeks back about all things WebVR and then some. Enjoy and share any feedback below! On Friday April 28th I had the opportunity to join construction tech stardom with an interview by ConTechTrio. 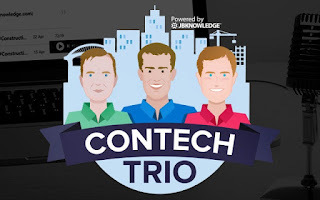 ConTechTrio is a podcast by construction technology gurus Rob Mckinney, James Benham, and Josh Bone. Every Friday the ConTechTrio review the current technology news and conduct an interview with a industry expert. They have interviewed some incredible people and it was an honor to be included in their lineup. Listen to "ConTechTrio 65: Damon Hernandez from AEC Hackathon & Samsung on Hacking Workflows in Construction" on Spreaker. Thanks again James, Rob, and Josh for the fun time and great opportunity. Spring is a time of new beginnings. Many plants begin to grow, flowers blossom, and the world comes out of winter hibernation. Yet it goes beyond a season and includes ideas of rebirth, rejuvenation, renewal, resurrection and regrowth. In the tech scene, it is also the blossom of a busy conference season. Let's take a look at some of the 'flowers' that attracted this tech bee the past few months. We start with March. The Game Developers Conference or GDC is THE event for those in the gaming industry and related technologies. As an attendee, I saw plenty of virtual reality on the expo floor. Over the past few years it has been amazing to see how companies like Unity, Google, and Facebook have increased the size of their presence at GDC. Since starting the first VR & AR hackathon in San Francisco back in 2014, I have assisted various teams and communities organizing immersive tech (VR,AR, etc.) focused hackathons. Our VR Hackathon (www.vrhackathon.com) community went international this year and 2017 will see more events planned in Europe, Asia, and Africa. While keeping things under one umbrella is a great way to keep the global immersive tech community connected, I have happily assisted others planning these types of hackathons to help grow the community and the industry. One team I was honored to assist is the team behind MIT's Reality, Virtually, Hackathon. See a full interview with David about the HoloLens Pokemon Go project here. Pretty cool projects huh? More of their work can be seen at their website and I highly recommend giving it a visit. For those that are looking for a digital creative agency that really knows how to make immersive technologies shine, give Simon and David a call. A great group of guys doing cutting edge work that definitely deserves a Metaverse1 salute.